excipients: glyceryl stearate SE, cetearete 12, cetearete 20, liquid parafin, glycerin, cetostearyl alcohol, methylparaben, propylparaben, diazolidinyl urea, disodium edetate, butyl hydroxy toluene, propylene glycol, dimethicone, water purified. Tretinoin is a retinoid and is the acid form of vitamin A.
Tretinoin is used primarily in the topical treatment of acne vulgaris when comedones, papules, and pustules predominate. It appears to stimulate mitosis and turnover of follicular epithelial cells and reduce their cohesiveness thereby facilitating the extrusion of existing comedones and preventing the formation of new ones. It also appears to have a thinning effect on the stratum corneum. Absorption does not seem to occur to any great extent with topical use. Tretinoin is the only metabolite of retinol, which is normally present in plasma. Silkaderm is used primarily in the topical treatment of acne vulgaris (both as monotherapy and in combination therapy). Silkaderm is applied topically to the skin. Patients should be instructed carefully in proper use of the drug, including associated precautions. The skin should be cleansed to remove excessive oiliness and dried 15 to 30 minutes before applying tretinoin lightly, once or twice daily according to response and irritation; some patients may require less frequent applications. Other topical preparations (including skin moisturisers) should not be applied at the same time as tretinoin is applied, and caution is required if other local irritants are used concurrently. There may be apparent exacerbations of the acne during early treatment and a therapeutic response may not be evident for 6 to 8 weeks. When the condition has resolved maintenance therapy should be less frequent. Silkaderm is contraindicated in pregnancy in breast-feeding mothers; women of child-bearing age must use effective contraception (oral progestogen-only contraceptives not considered effective). Silkaderm is contraindicated in personal or familial history of cutaneous epithelioma. 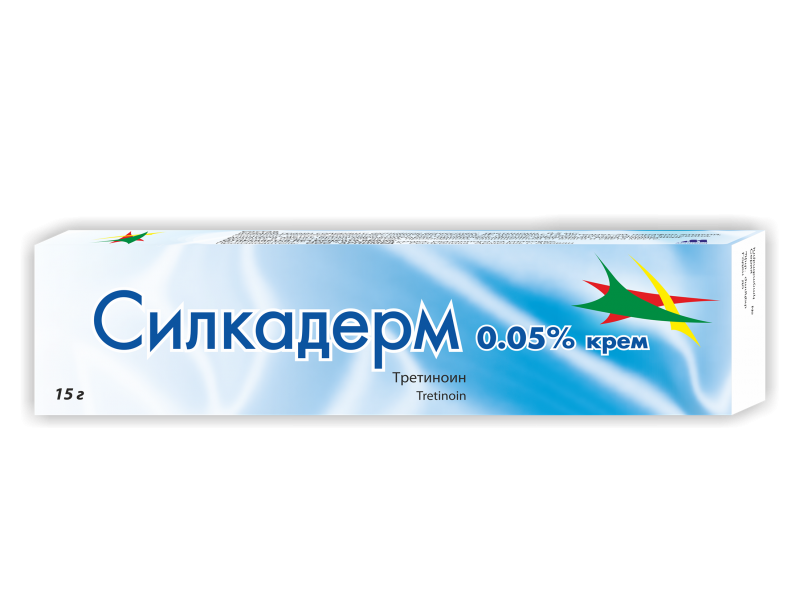 Silkaderm is contraindicated in eczema, severe inflammatory skin diseases, rosacea. Silkaderm is contraindicated in hypersensitivity to any of drug components . Tretinoin is a skin irritant. Topical application may cause transitory stinging and a feeling of warmth and in normal use it produces some erythema and peeling, similar redness, dry skin to that of mild sunburn. Sensitive individuals may experience oedema, blistering, and crusting of the skin, eye irritation. Excessive application can cause severe erythema, peeling, and discomfort with no increase in efficacy. Temporary hypopigmentation and hyperpigmentation have been reported. Silkaderm should be avoided in severe acne involving large areas. Contact with eyes, nostrils, mouth and mucous membranes, eczematous, broken or sunburned skin should be avoided. Silkaderm should be used with caution in sensitive areas such as the neck, and accumulation in angles of the nose should be avoided. Exposure to UV light (including sunlight, solariums) should be avoided; if sun exposure is unavoidable, an appropriate sunscreen or protective clothing should be used. Use of Silkaderm with abrasive cleaners, comedogenic or astringent cosmetics should be avoided and there should be no depilatory treatments. Allow peeling (e.g. resulting from use of benzoyl peroxide) to subside before using a Silkaderm; alternating a preparation that causes peeling with a topical retinoid may give rise to contact dermatitis (reduce frequency of Silkaderm application). After Silkaderm application probably short-term feeling of warmth and / or burning, until the 5th week of treatment may be a slight reddening of the skin. In case of severe skin irritation Silkaderm should be applied rarely. In the first week of treatment may increase acne. If the patient was treated with other drugs, especially keratolytics, the application should be deferred until Silkaderm disappearance of their implications. When the manifestation of side effects (dry skin, erythema, local irritation, burning, peeling skin at the site of application, swelling, eye irritation, swelling) should temporarily discontinue use until the disappearance of these symptoms. With tanned skin can begin treatment after easing sunburn. Safety and efficacy of Silkaderm in pediatric patients younger than 18 years of age have not been established. Due to the low absorption of the drug overdose when applied topically is unlikely. With oral Silkaderm observed the same symptoms as in an overdose of Vitamin A.
Silkaderm used only externally. If the drug was accidentally applied inside, immediately wash the stomach and should be suitable to conduct therapy. Concomitant use of Silkaderm with other topical medications (especially those containing keratolytic agents such as sulfur, resorcinol, benzoyl peroxide, or salicylic acid) should be undertaken with caution because of the possibility of interactions. In patients who have used keratolytic agents, sufficient time should elapse for the effects of these drugs to subside before initiating Silkaderm therapy. 15 g of cream is filled into aluminum tubes (inside package).